‘Dare to be different!’ says Honda. Well, you would be if you bought its latest Honda Civic 4-door model. 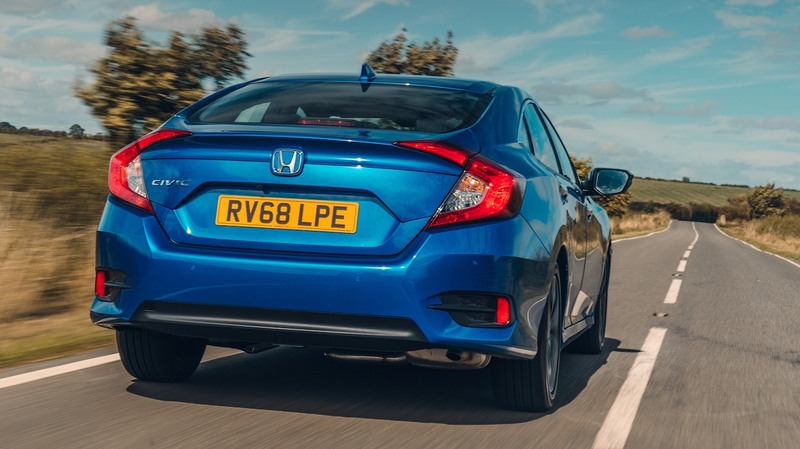 It’s the first time a Civic has been produced as such for the UK market and will, in fact, most likely be found in relatively small numbers as company, rather than privately-owned, vehicles. Depending on how high up the executive chain you are, then it will be either the 6-speed manual version or the 9-speed automatic. Given a choice, the auto would be mine. It’s not perfect: using the paddle to change from fifth to fourth gear for engine braking assistance down a steep hill, the slight pause in the shift allowed the car actually to go momentarily faster. This was unexpected and a touch disconcerting. At all other times, the auto box behaved just fine and was equally happy in busy town traffic or out on sweeping country roads, the changes being virtually imperceptible. The manual, meanwhile, proved to have quite pleasant and easy changes and the engine, once it was driven at cruising speed, was quiet enough to make me wonder which gear, fourth or sixth, I was in. A glance at the rev-counter gave the answer, once I had spotted it as a very minor part of the instrument display. Regular drivers of the new Civic automatic will naturally soon not find this to be an issue. Whereas the manual box is as traditional as any, the automatic’s control arrangements, in the central console, are less so and rather unusual: there is simply a ‘D’ button (that also has an ‘S’ for sport mode with further acceleration), nudging against and above that is the ‘N’ for neutral button and, so to speak, over the top and out of sight is ‘R’ for reverse. Then, separate from these is ‘P’ for park. An electric switch at the bottom end of all these provides automatic hand-brake release. As mentioned, there are paddles for more hands-on driving. Driving the car is a pleasant enough experience. The seats were very comfortable, with nicely-finished cloth upholstery in the SR cars (leather in the range-topping EX). The steering wheel tended towards the chunky, but with a soft touch. The suspension was supple and gave a good ride whilst allowing the car to be driven confidently in a fairly sporting but not excessively fast fashion. Depending on how low the driver’s seat is set and how tall the driver, the exterior mirror at times obscured the view, particularly, for example, negotiating tighter roundabouts; generally, the visibility outwards was good. Space in both the front and rear is suitable for four averagely-tall adults. However, there are no USB ports or any individual air vents and the like in the back, which rather hints that Honda sees this car as more often than not being a one- or two-person carrier. The boot is capacious enough, with a flat floor, underneath which, though, there is no spare wheel. Performance is brisk enough if needs be. Zero-to-sixty-two mph from the 120 PS 1.6 I-DTEC diesel manual SR takes 10.1seconds. 70 mph is a doddle at hardly 2000 rpm and I would think that well over 50 mpg is easily attainable especially on longer journeys. On the test route, mainly rural, but with some slower driving through villages and town, the manual’s trip computer showed 52.1 mpg and the automatic’s 48.2. For comparison, the official combined consumption figures are an impressive 80.7 mpg for the manual and 68.9 for the automatic. Emissions for the two are equally different at 93 and 109 g/km respectively. Company accountants will no doubt go for the manuals! The satellite navigation system, excepting on the SE base version, as part of Honda CONNECT, is displayed on a 7-inch screen. The Honda Civic 4-door range starts at £20,245. The test cars were £23,115 (including £525 for the pearlescent paint) for the manual SR and £26,620 for the auto EX, free pearlescent paint.